Like every other product, an air fryer has pros and cons. The advantages of using an air fryer vs. your traditional fryer are pretty great for the most part. Air fryers usually make way less of a mess. It eliminates the fried-food smell in your home and is easy to use. 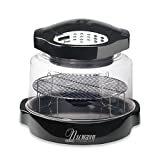 These oil less fryers are good for your health in that they help you to avoid saturated fats which can come from food fried by traditional deep fryers. So as you can see, there are tons of advantages to getting this appliance. However, when shopping for an air fryer, you need to be wary of some of the disadvantages that come with using one. You could say that air fryers are much more high maintenance than your traditional oil fryers. Air fryers cook your food at between 300-400 degrees. If you don’t pull your food out at just the right time, you are at a high risk of scorching your meal or snack. For that reason, an air fryer is not a set it and forget it kitchen appliance. When you are using it, you need to make sure that you can be fully present in your kitchen to check on your food to see when it is fully cooked. The good news is, the cooking time in an air fryer is significantly less than other cooking methods. Some air fryers such as Philips airfryer come with ready signal and auto shut-off features that help you to avoid overcooking or burning your foods. An air fryer can dry out the foods really quickly if you don’t keep a close eye on your air fryer. When you are cooking food in an oil fryer, you don’t run the same risk because your food is going to be able to develop that outer crispness while staying moist on the inside. This is another downside from using an air fryer that you just don’t get with an oil fryer. When you start roasting or cooking meat in your fryer, you may notice a buildup of a blackened crust on the outside of your meat. That black crust is known as acrylamide, a fairly common compound that can potentially cause cancer. This may raise some concerns whether an air fryer is safe for health. The black crust occurs when you overcook your food. An air fryer actually helps you to control exact temperature and time to avoid overcooking. Some air fryers also comes with preset programs to make sure that you get the right cooking results. For example, Philips XL Airfryer HD9240 has smart preset button to remember the settings for your favorite food. GoWise 4th Generation Air Fryer comes with seven smart programs built-in that are preset for fish, steak, shrimp, chips, chicken, meat, or manual operation. Both are in top models of our air fryer reviews. Also, if you see the black crusts on your meat, make sure that you are removing them before eating. All in all, these oil-less fryers can make your life much easier and make cooking a lot faster. Nonetheless, they aren’t absolutely perfect. Make sure that you keep these disadvantages of using an air fryer in mind before you get one for yourself. Look for air fryer reviews to find a good one with features that prevent overcooking and drying out the foods.